"The Guide to Christian Marriage" is essential reading for both couples and their families and friends, whether inside or outside the churches, who are preparing to get married in church or who want to know more about church weddings. It praises marriage, and sets out what marriage means today. It answers questions, such as: what actually happens at the exchange of vows? Can divorcees be remarried in church? What is the true history and meaning of the ritual and the symbolism? What does the priest actually do? And are people refused Christian marriage if they are already living together, or if they have children out of wedlock? 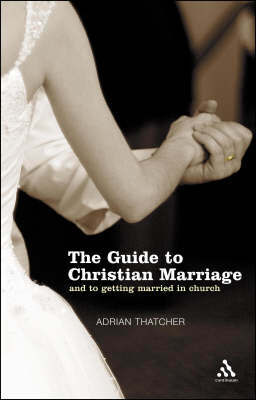 Professor Adrian Thatcher takes readers through the marriage service and addresses many practical queries that will help a couple to plan their ceremony. He also gives advice on how to continue having a happy relationship long after the ceremony is over.